Californians in 2008 voted for Proposition 1-A, “The Safe, Reliable High Speed Passenger Train Bond Act for the 21st Century”. What CHSRA plans is NEITHER SAFE NOR RELIABLE. Under STB guidance, HSR can be made much better, safer, more reliable, and less costly – a shining example for others nation-wide and around the world. Demand total grade separation and secure fencing. We grade separate and fence against intrusion our Interstate and other roads at highway speeds. Motor vehicles can stop much faster than trains. Grade crossings and public access to tracks leave trains vulnerable to accidents, delays, suicides, sabotage, and even terrorist attacks. Amtrak’s Bourbonnais derailment on 79 mph track – two locomotives and 11 of 14 cars – illustrates what can happen at a grade crossing. Stop HSR funding for Caltrain modifications immediately. CHSRA plans to use Caltrain tracks (now 79 mph) between San Jose and San Francisco and is providing major funding for this “Bookend” to electrify and extend Caltrain. HSR trains roaring through stations and over dozens of at-grade road crossings at 125 mph as CHSRA plans would be hazardous and costly. Far better: terminate this phase of HSR to the Bay Area at San Jose Diridon, with seamless transfers there to Caltrain, Capitol Corridor, ACE, BART. Amtrak, and VTA light rail. 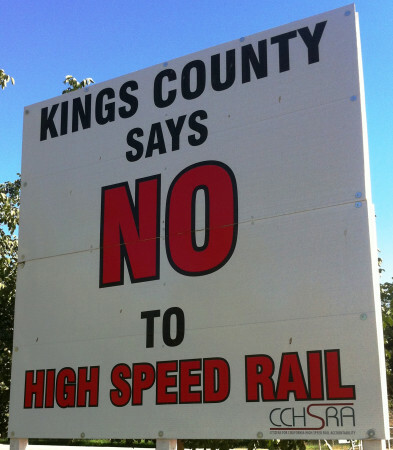 Don’t squander precious HSR funds on Caltrain tracks unsafe for HSR operation. Serve San Francisco Better – through Oakland. These ideas are not new. I have made them many times to CHSRA and others, only to be greeted by a wall of silence.